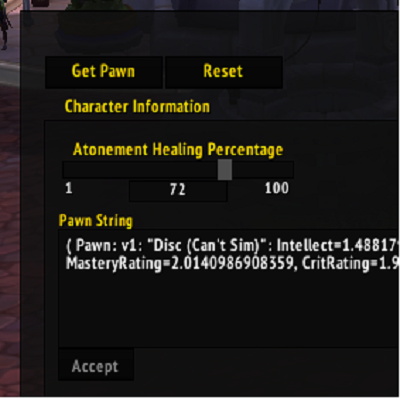 Can't Sim will take into account all of your stats and then build a pawn string for you based on the needs and requirements of your spec. The algorithm to determine this is taken from class discords where the data has been hammered out into Google Sheets. Can't Sim removes the requirement of going from game to Google Sheet to get your stat weight. /cs get - generates your pawn string and displays it to you for your use.